Thanks to decades of exploration using robotic orbiter missions, landers and rovers, scientists are certain that billions of years ago, liquid water flowed on the surface of Mars. Beyond that, many questions have remained, which include whether or not the waterflow was intermittent or regular. In other words, was Mars truly a “warm and wet” environment billions of years ago, or was it more along the lines of “cold and icy”? These questions have persisted due to the nature of Mars’ surface and atmosphere, which offer conflicitng answers. According to a new study from Brown University, it appears that both could be the case. Basically, early Mars could have had significant amounts of surface ice which experienced periodic melting, producing enough liquid water to carve out the ancient valleys and lakebeds seen on the planet today. The study, titled “Late Noachian Icy Highlands Climate Model: Exploring the Possibility of Transient Melting and Fluvial/Lacustrine Activity Through Peak Annual and Seasonal Temperatures“, recently appeared in Icarus. Ashley Palumbo – a Ph.D. student with Brown’s Department of Earth, Environmental and Planetary Science – led the study and was joined by her supervising professor (Jim Head) and Professor Robin Wordsworth of Harvard University’s School of Engineering and Applied Sciences. For the sake of their study, Palumbo and her colleagues sought to find the bridge between Mars’ geology (which suggests the planet was once warm and wet) and its atmospheric models, which suggest it was cold and icy. As they demonstrated, it’s plausible that during the past, Mars was generally frozen over with glaciers. During peak daily temperatures in the summer, these glaciers would melt at the edges to produce flowing water. To determine the link between the atmospheric models and geological evidence, Palumbo and her team began with a state-of-the-art climate model for Mars. This model assumed that 4 billion years ago, the atmosphere was primarily composed of carbon dioxide (as it is today) and that the Sun’s output was much weaker than it is now. From this model, they determined that Mars was generally cold and icy during its earlier days. However, they also included a number of variables which may have also been present on Mars 4 billion years ago. These include the presence of a thicker atmosphere, which would have allowed for a more significant greenhouse effect. Since scientists cannot agree how dense Mars’ atmosphere was between 4.2 and 3.7 billion years ago, Palumbo and her team ran the models to take into account various plausible levels of atmospheric density. They also considered variations in Mars’ orbit that could have existed 4 billion years ago, which has also been subject to some guesswork. Here too, they tested a wide range of plausible scenarios, which included differences in axial tilt and different degrees of eccentricity. This would have affected how much sunlight is received by one hemisphere over another and led to more significant seasonal variations in temperature. In the end, the model produced scenarios in which ice covered regions near the location of the valley networks in the southern highlands. While the planet’s mean annual temperature in these scenarios was well below freezing, it also produced peak summertime temperatures in the region that rose above freezing. The only thing that remained was to demonstrate that the volume of water produced would be enough to carve those valleys. Luckily, back in 2015, Professor Jim Head and Eliot Rosenberg (an undergraduate with Brown at the time) created a study which estimated the minimum amount of water required to produce the largest of these valleys. Using these estimates, along with other studies that provided estimates of necessary runoff rates and the duration of valley network formation, Palumbo and her colleagues found a model-derived scenario that worked. Basically, they found that if Mars had an eccentricity of 0.17 (compared to it’s current eccentricity of 0.0934) an axial tilt of 25° (compared to 25.19° today), and an atmospheric pressure of 600 mbar (100 times what it is today) then it would have taken about 33,000 to 1,083,000 years to produce enough meltwater to form the valley networks. But assuming for a circular orbit, an axial tile of 25°, and an atmosphere of 1000 mbar, it would have taken about 21,000 to 550,000 years. It is also significant in that it demonstrates that Mars climate was subject to variations that also happen regularly here on Earth. This provides yet another indication of how our two plane’s are similar in some ways, and how research of one can help advance our understanding of the other. Last, but not least, it offers some synthesis to a subject that has produced a fair share of disagreement. The subject of how Mars could have experienced warm, flowing water on its surface – and at a time when the Sun’s output was much weaker than it is today – has remained the subject of much debate. In recent years, researchers have advanced various suggestions as to how the planet could have been warmed, ranging from cirrus clouds to periodic bursts of methane gas from beneath the surface. While this latest study has not quite settled the debate between the “warm and watery” and the “cold and icy” camps, it does offer compelling evidence that the two may not be mutually exclusive. The study was also the subject of a presentation made at the 48th Lunar and Planetary Science Conference, which took place from March 20th to 24th in The Woodland, Texas. Get ready, because here are some more findings about possible water on Mars. 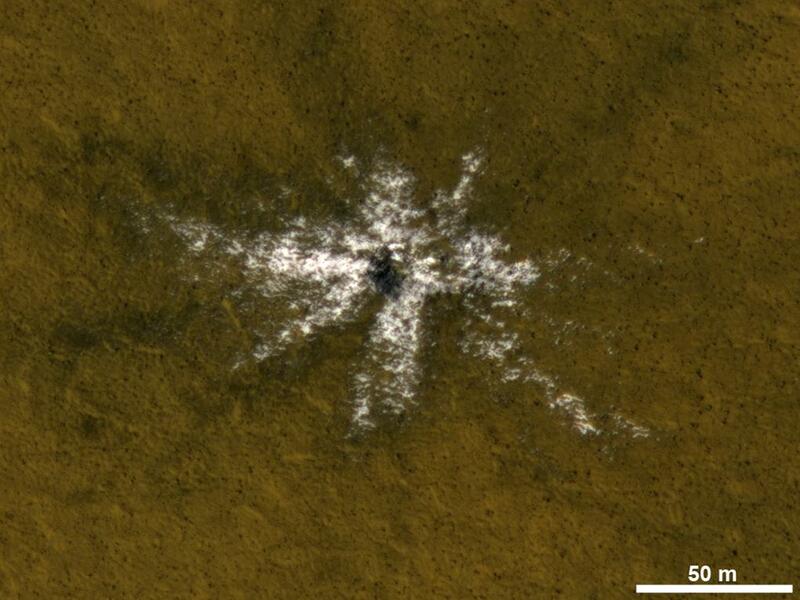 This picture above from the Mars Reconnaissance Orbiter is a series showing changing dark lines on an equatorial hillside — which could be an indication of salty water, scientists said. As MRO circled the planet and peered at the lines with its High Resolution Imaging Science Experiment (HiRISE) camera, it tracked these changes at five locations in Valles Marineris, the biggest canyon our solar system has to offer. The lines were on slopes that faced the north and the south, and most intriguingly, they activated when the sun hit their respective sides. “The equatorial surface region of Mars has been regarded as dry, free of liquid or frozen water, but we may need to rethink that,” stated Alfred McEwen of the University of Arizona in Tucson. Scientists first spotted these types of features two years ago in the mid-latitudes of Mars, but in that case these were small features (usually less than 16 feet or five meters wide). The slopes observed here range as wide as 4,000 feet (1,200 meters). Salt can keep water flowing even in temperatures where more pure water gets frozen, and also reduce the evaporation rate. NASA also noted it used data from two other MRO instruments (Compact Reconnaissance Imaging Spectrometer for Mars and the Context Camera) and the Mars Oddysey’s Thermal Emission Imaging System. That’s not all, however. Scientists also reported 15 fresh craters that excavated ice that used to be hidden underneath the soil of Mars. “The more we find, the more we can fill in a global map of where ice is buried,” stated Colin Dundas of the United States Geological Survey in Flagstaff, Ariz. Results were presented at the American Geophysical Union’s fall meeting this week. The Mars One non-profit foundation that aims to establish a permanent human settlement on the Red Planet in the mid-2020’s – with colonists volunteering for a one-way trip – took a major step forward today, Dec. 10, when they announced plans to launch the first ever privately funded space missions to Mars in 2018; as forerunners to gather critical measurements. Bas Lansdorp, Mars One Co-founder and CEO announced plans to launch two missions to the Red Planet in 2018 – consisting of a robotic lander and an orbiting communications satellite; essential for transmitting the data collected on the Red Planet’s surface. And he has partnered with a pair of prestigious space companies to get started. Lansdorp made the announcement at a news media briefing held today at the National Press Club in Washington, DC. “This will be the first private mission to Mars and the lander’s successful arrival and operation will be a historic accomplishment,” said Lansdorp. Lansdorp stated that Mars One has signed contracts with Lockheed Martin and Surrey Satellite Technology Ltd. (SSTL) to develop mission concept studies – both are leading aerospace companies with vast experience in building spacecraft. The 2018 Mars One lander would be a technology demonstrator and include a scoop, cameras and an exotic solar array to boost power and longevity. The spacecraft structure would be based on NASA’s highly successful 2007 Phoenix Mars lander – built by Lockheed Martin – which discovered and dug into water ice buried just inches beneath the topsoil in the northern polar regions of the Red Planet. Lockheed Martin engineers will work for the next 3 to 4 months to study mission concepts as well as how to stack the orbiter and lander on the launcher,” Sedivy said at the briefing. “The lander will provide proof of concept for some of the technologies that are important for a permanent human settlement on Mars,” said Lansdorp. Two examples involve experiments to extract water into a usable form and construction of a thin film solar array to provide additional power to the spacecraft and eventual human colonists. It would include a Phoenix like scoop to collect soils for the water extraction experiment and cameras for continuous video recording transmitted by the accompanying orbiter. Lockheed Martin is already under contract to build another Phoenix type lander for NASA that is slated to blastoff in 2016 on the InSight mission. “They have a distinct legacy of participating in nearly every NASA mission to Mars,” said Lansdorp. So if sufficient funding is found it seems apparent that lander construction should be accomplished in time. However, building the science instruments from scratch to meet the tight timeline could be quite challenging. Given that the lander is planned to launch in barely over four years, I asked Sedivy if that was sufficient time to select, design and develop the new science instruments planned for the 2018 mission. “A typical life cycle for the Mars program provides three and a half years from commitment to design to launch. So we have about 1 year to commit to preliminary design for the 2018 launch, so that’s favorable,” Sedivy told Universe Today. “So we will provide Mars One with input as to where we see the development risks. And we’ll help guide the instrument selections to have a high probability that they will be ready in time for the 2018 launch window,” Sedivy told me. For the 2018 lander, Mars One also plans to include an experiment from a worldwide university challenge and items from several Science, Technology, Engineering and Math (STEM) challenge winners. Surrey Satellite Technology Ltd. (SSTL) was selected to studying orbiter concepts that will provide a high bandwidth communications system in a Mars synchronous orbit and will be used to relay data and a live video feed from the lander on the surface of Mars back to Earth, according to Sir Martin Sweeting, Executive Chairman of SSTL. There are still many unknowns at this stage including the sources for all the significant funding required by Mars One to transform their concepts into actual flight hardware. “Crowdfunding and crowdsourcing activities are important means to do that,” said Lansdorp. At the briefing, Lansdorp stated that Mars One has started an Indiegogo crowdfunding campaign. The goal is to raise $400,000 by Jan. 25, 2014. Mars One is looking for sponsors and partners. They also plan a TV show to help select the winners of the first human crew to Mars from over 200,000 applicants from countries spread all across Earth. The preliminary 2018 mission study contracts with Lockheed and Surrey are valued at $260,000 and $80,000 respectively. Stay tuned here for Ken’s continuing Curiosity, Chang’e 3, LADEE, MAVEN and MOM news and his upcoming Antares launch reports from on site at NASA Wallops Flight Facility, VA.